Newcastle’s East Quayside regeneration scheme has created a network of new public spaces and buildings, linked by a waterfront promenade. Designed by Terry Farrell & Partners. This successful urban waterfront regeneration project, in a dramatic setting on the north bank of the River Tyne, stretching downstream from the Malmaison Hotel, and is linked by the award winning Gateshead Millennium Bridge661a to Gateshead Quays, where the Baltic, a former grain warehouse converted into a new international centre for contemporary art, creates a key visual focal point across the river. A waterfront promenade runs the length of the scheme, linking together new public spaces and buildings, including offices associated with the nearby Law Courts, a hotel and new waterfront apartments. The promenade is a hub of activity, offering among its attractions restaurant and bar facilities to visitors of all types. The opening bridge gives access across the river to the Baltic by foot and cycle, and both attract large numbers of sightseers. Sir Terry Farrell started his own practice in 1980, after working very successfully with Nick Grimshaw [now Sir Nick Grimshaw]. His new practice embraced post-modern design, a rather unhappy architectural style exemplified by his projects MI6 Headquarters and Embankment Place London, where the office building spanned over Charing Cross station using a series of 9m deep beams and used the air rights over the station complex. The practice has evolved into a world-class architect-planner team with some wonderful buildings and exciting master plans. 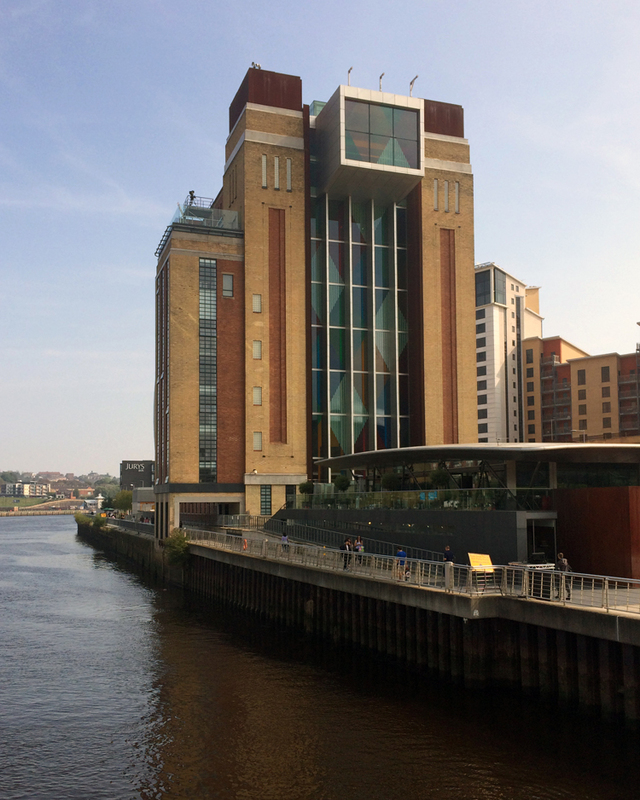 There are so many fabulous parts of the Quayside, on both sides of the river. The Newcastle side boasts Malmaison, the new Law Courts, Pitcher and Piano, whilst Gateshead put its efforts into the world-class venue that is the Sage, designed by Norman Foster, and the Baltic Centre for Contemporary Arts, the largest gallery in the world, converted from an old flour mill. What a conversion it was, the whole brick structure supported by a steel frame as the interior was gutted and rebuilt. Originally designed by Gelder and Kitchen architects of Hull, Ellis Williams Architects won an open competition for its regeneration. 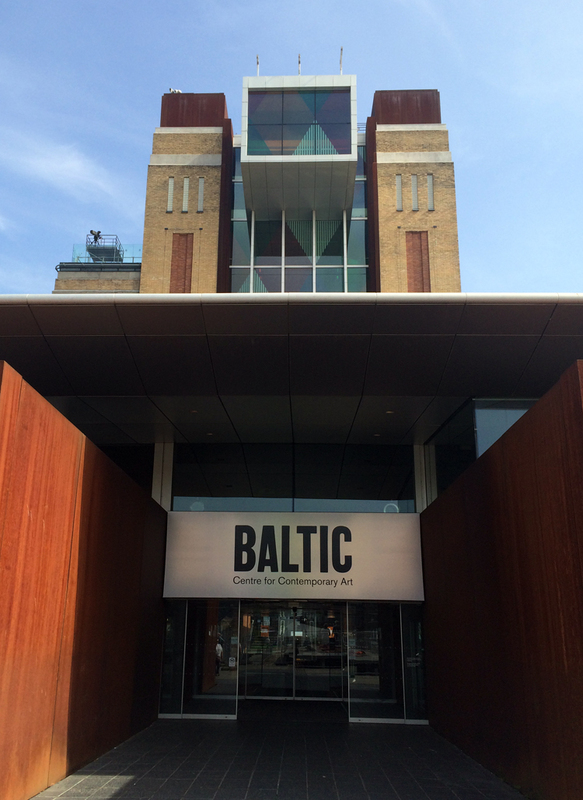 Such is the patronage of Gateshead Council, that the Royal Institute of British Architects awarded it the RIBA Arts Client of the Year in 2005. 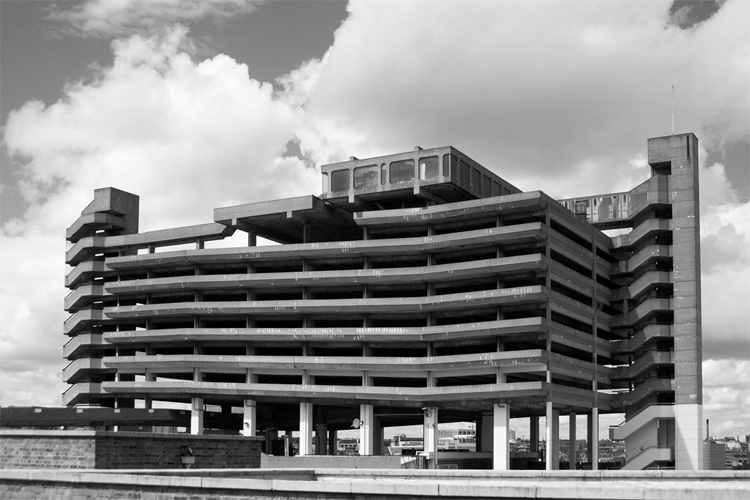 It’s certainly more popular architecture than Gateshead’s other claim to architectural fame – the car park used to film “Get Carter”. No, we don’t know either. Does it mean unfinished? 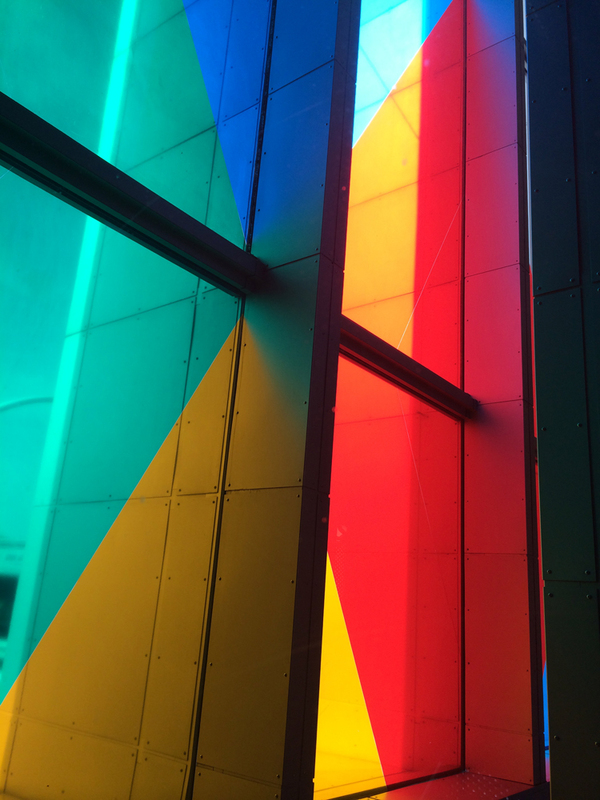 More successful is the installation of Daniel Buren, France’s greatest living artist. 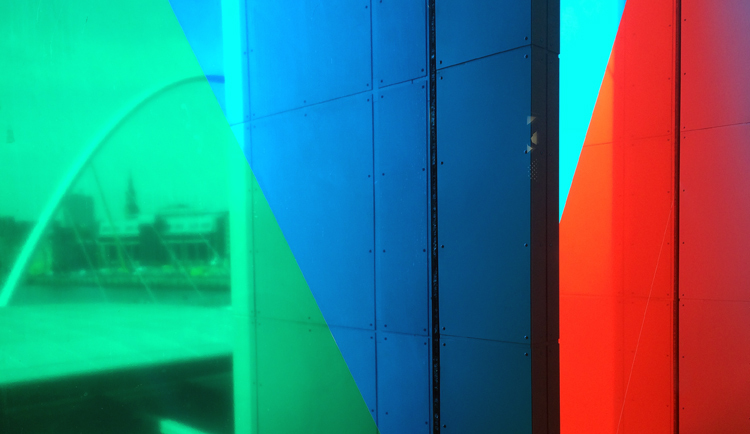 His work can be seen on two floors, and in the coloured panels on the main facade – see below. 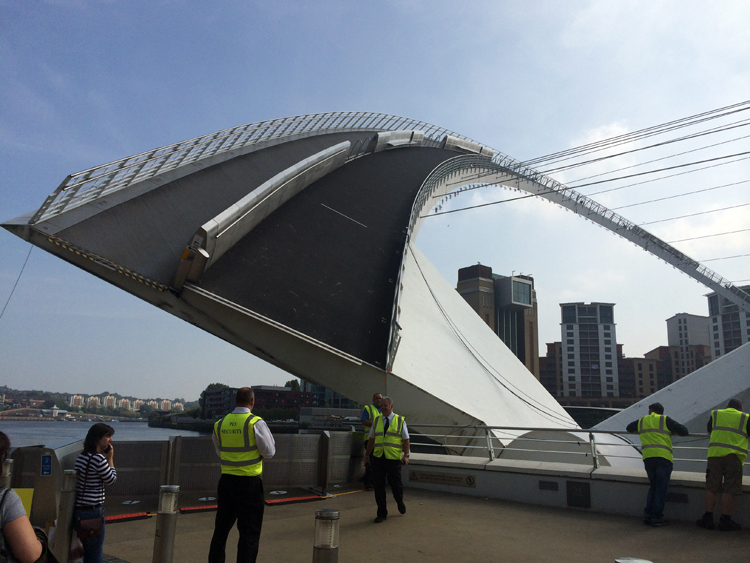 Nonetheless, a fantastic setting, linked to the Newcastle side over the Millennium bridge designed by Wilkinson Eyre, and good food. Mug of Celeriac soup and half a cheese and pickle sandwich anyone? 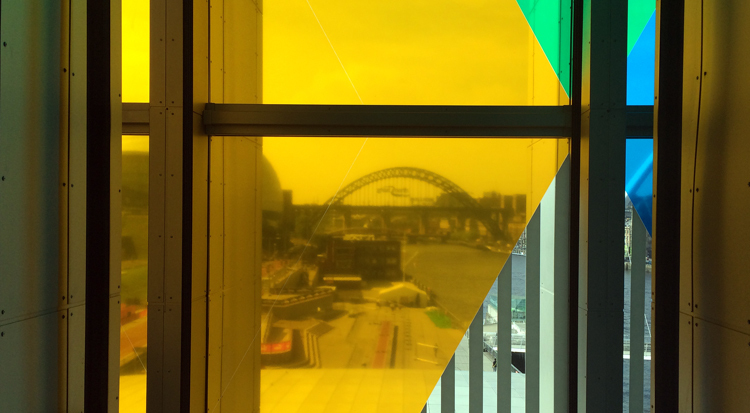 The amazing joint venture that is Newcastle Gateshead – and the people of the cities must be the friendliest in the country/UK/universe – even more than Yorkshire.